The vocal acrobat and captivating actress Salome Kammer lives up to her reputation in this performance in Coburg; a reputation she has gained through numerous world premieres in the realm of music theatre. She succeeded in making the drama, which is played out solely in Elsa’s head in Sciarrino’s “Lohengrin”, a palpable stage experience. Whether she is making noise or sound, distorted natural sound or finally singing at the end – Salome Kammer demonstrates just what the human voice is capable of in terms of the diversity of sound production. 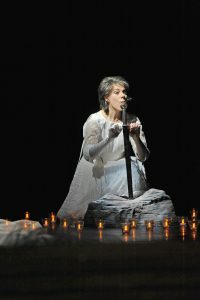 Salome Kammer is instantly mesmerising as Elsa through her stage and vocal presence. She purrs with her vocal cords, bills and coos, whispers, breathes fast text passages, makes rhythmic plopping sounds with her lips. What at first seems strange soon has the audience under its spell: just as words are formed from letters, so too does this vocal landscape, at first so unfamiliar, develop into a very clear and heartfelt narrative style. 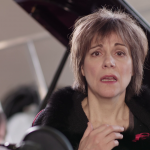 Only a diseuse of recitative art such as the versatile virtuoso Salome Kammer can create a new synthesis of the arts from such fragile, endangered material. …Sciarrinos Lohengrin ist ein Experiment, das sich an jenen Grenzen bewegt, wo aus dem Atmen heraus sich erst die Töne bilden, die Töne in Geräusche übergehen und die Geräusche wiederum in Stille versickern. Nur eine Duse der Sprechgesangskunst wie die virtuos wandelbare Salome Kammer kann aus so einem zerbrechlichen, gefährdeten Material wiederum ein neues Gesamtkunstwerk erschaffen. Nun steht die Kammer in Coburg auf der Bühne, schmust zwischen flackernden Teelichtern mit einer alten Ritterrüstungsbeinschiene herum, vergewaltigt lüstern ein paar Federkissen, tanzt eine Siebenschleiertanz und grunzt, wispert, ächzt, kichert. NWZonline.de, 27/1/2014 — Kammer generates a breath-taking psycho-acoustic portrait of Elsa through gasping, whispering, snorting, chortling, speaking, chirruping and finally also singing. She switched virtuously between situations and characters and in so doing, allowed a uniquely vibrant world to be portrayed on stage. Weser Kurier, 27/1/2014 — Elsa is portrayed by Salome Kammer who has to produce a wide arsenal of noises and onomatopoeia. She breathes, pants, retches, imitates the bird of the night and generates all sorts of natural sounds. She switches between the three (very well and discreetly adjusted) microphones at her disposal. And she speaks: sometimes whispering and beseeching, sometimes resigned and stunned and sometimes breaking into hysterical laughter. 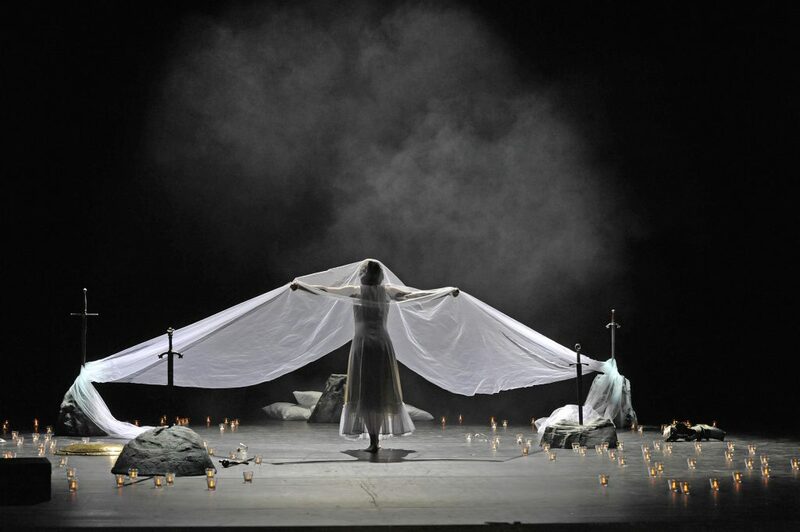 Now and then she also slips into the role of Lohengrin or imitates the crowd’s calls of “Elsa”. Kammer approaches her task with unbelievable intensity, virtuosic expressiveness and highly varied body language. An impressive performance!